The Inez Grant Parker Rose Garden at 2125 Park Blvd. in Balboa Park is accepting volunteers, novice or experienced, to join the Rose Garden Corps. Volunteers work in the garden trimming off dead blooms, weeding, raking, fertilizing, pruning and planting new varieties. Volunteer days are Tuesday and/or Thursday mornings, preferably weekly, for 2-3 hours. A monthly meeting in the Rose Garden the third Tuesday of each month at 9:15 a.m. is used to share information and direct needed work. Volunteers learn about roses, and also act as goodwill ambassadors to the many tourists who frequent the garden. Those interested may contact Mary Rose at bprosegardencorps@gmail.com. The Marston House closed March 27 so that a new roof and gutters could be installed. The historic house is expected to reopen July 1, according to Save Our heritage Organisation (SOHO), the nonprofit preservation group that operates the Arts & Crafts mansion at 3525 Seventh Ave. in Balboa Park. Much of the gardens and lawn with shade trees will remain open to pedestrians during construction. The Marston House Museum Shop in the estate’s carriage house will stay open Saturdays and Sundays from 10 a.m. to 5 p.m. The museum’s walking tours will continue to run, and have expanded to every weekend during this time. For more information, visit bit.ly/2nTfcA5. In addition, SOHO hopes to complete some interior restoration projects while the museum is closed if enough funds become available. To donate to the Marston House Restoration Fund, visit bit.ly/2nTfmr5. The Gaslamp Quarter Association, in conjunction with the Downtown Partnership Clean & Safe program, will collaborate in the Gaslamp’s 150th anniversary celebration with the installation of 15 fiberglass rabbit statues in the Gaslamp Quarter. The “Rabbitville” public art project will educate visitors about the Gaslamp Quarter’s history. “Rabbitville” will feature 15 fiberglass rabbit statues painted and decorated by local artists prominently displayed in the Gaslamp Quarter starting in April. Prior to the settling of New Town by Alonzo Horton in 1867, the area now known as Downtown San Diego, was jokingly nicknamed “Rabbitville.” The lighthearted moniker referred to the failed attempts by others to build a city on San Diego Bay. Where these early pioneers had failed to build a city for people, they were successful in making a great habitat for the local rabbit population. The rabbit is a symbol paying homage to the old nickname as well as being a common symbol for renewal and hope. These 15 sculptures (one for each decade) will be markers of how the Gaslamp Quarter has grown. Assemblymember Todd Gloria (D-San Diego) named San Diego City Attorney Mara W. Elliott the 2017 Woman of the Year for the 78th Assembly District. The Woman of the Year celebration is an annual event in the California State Capitol that highlights the achievements of outstanding women throughout the state. During the celebration, one woman from each assembly district is introduced on the assembly floor and receives a special certificate of recognition honoring her accomplishments. Elliott was elected as the San Diego City Attorney in November 2016, winning 57 percent of the vote in her first bid for public office. 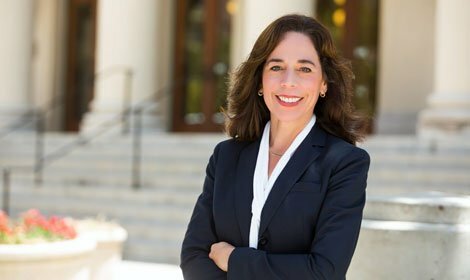 As the City Attorney, Elliott provides legal advice to city officials and departments, sues and defends on behalf of the city of San Diego, and prosecutes misdemeanor cases as well as consumer and environmental laws. She oversees a team of 150 attorneys and a staff of 350. The Balboa Park Conservancy, in partnership with the city of San Diego’s Park & Recreation Department, planted 21 new trees around Morley Field Dog Park on Balboa Park’s east mesa in March as part of its ongoing efforts to diversify and augment the park’s urban forest. The planting of 14 jacarandas and seven Torrey pines, donated by The Village Garden Club of La Jolla, Jacaranda Project, took place on March 22. The following day, fifth-graders from Chollas Meade Elementary School were trained by experts from Tree San Diego in the watering and care of new and mature trees as part of its San Diego Junior Tree Steward Certification program. For more information, visit balboaparkconservancy.org. The Museum of Contemporary Art San Diego (MCASD) is one of 30 finalists for the 2017 National Medal for Museum and Library Service, awarded by the Institute of Museum and Library Services (IMLS), the government agency that is the primary source of federal support for the nation’s 123,000 libraries and 35,000 museums. The National Medal is the nation’s highest honor given to museums and libraries for service to the community. Finalists are chosen because of their significant and exceptional contributions to their communities. IMLS is encouraging community members who visited the Museum of Contemporary Art San Diego to share their story on the IMLS Facebook page. To share your story and learn more about how these institutions make an impact, visit facebook.com/USIMLS. The National Medal winners will be announced later this spring. MCASD Downtown is located at 1100 Kettner Blvd. 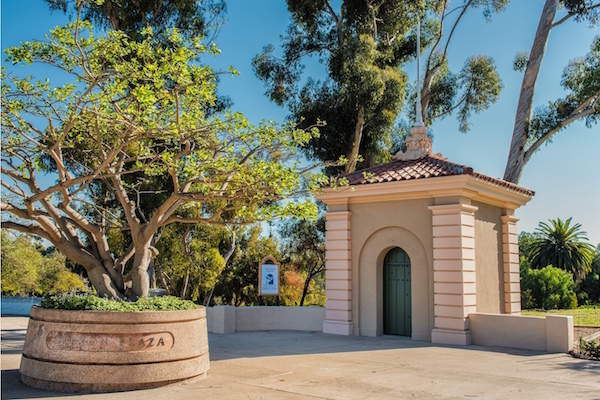 Friends of Balboa Park has completed the restoration of the historic gate houses that welcome visitors into Balboa Park on the west side of the Cabrillo Bridge. The structures were originally installed for the 1915 Panama-California Exposition as the main entry to the park. Over the decades, they fell into disrepair until Friends of Balboa Park accepted them as a restoration project in 2014. The project took an estimated 18 months and cost approximately $140,000. Friends of Balboa Park is a group that enhances and maintains the park through donations and park programs. For more information, visit friendsofbalboapark.org. CBRE Group Inc. announced the sale of an office building in San Diego’s Little Italy for $4 million to Kristie Nova, owner of Bespoke Partners Investment’s, LLC and Founding Partner of Bespoke Partners. CBRE Vice President Marc Frederick, based in San Diego, and Bud Marsh of Colliers International represented the undisclosed seller. The buyer was represented by Ryan King of Voit Commercial. The 10,500-square-foot, two-story building located at 909 West Laurel St., includes 30 private parking spaces and was sold vacant. Bespoke Partners, a local retained executive search firm, plans to move into the building and has hired BASILE Studios to design a contemporary creative office space. Bespoke plans to relocate into their new space within nine months. According to CBRE Research, Downtown was one of the most active submarkets last quarter. Downtown San Diego led the county in 2016 in net absorption and leasing activity, and is currently at historic peak rents. The San Diego County Bar Foundation awarded $110,000 from its 2016 Indigent Criminal Defense Fund to three San Diego nonprofits that offer legal defense programs for individuals and families. The charitable arm of the San Diego County Bar Association, the Bar Foundation created its Indigent Criminal Defense Fund to further and support indigent criminal defense programs, projects and activities in San Diego County. The Bar Foundation invests in legal assistance and advocacy for people and communities in the region impacted by poverty, abuse and discrimination. California Veterans Legal Task Force received $30,000 to help veterans secure criminal defense assistance for charges they are facing, with the hope that they will receive mental health treatment rather than custody. The program also provides legal students with hands-on experience providing legal assessments, experience with mental health issues and knowledge about veterans’ legal needs. St. Vincent de Paul Village was awarded $30,000 to fully fund the Homeless Court Program, a special San Diego Superior Court session for homeless defendants to resolve outstanding misdemeanor offenses and warrants. The funds will support 100 percent of the program’s case management, operation expenses and the salary of a Homeless Court Representative. Think Dignity was awarded $50,000 to support The Homeless Youth Legal Advocacy Project, which works with homeless youths who have aged out of foster care, to reduce sentences and expunge and seal their juvenile records so the youths can seek employment with a clean record. The Indigent Criminal Defense Fund is made possible by a grant from the San Diego County Bar Association through extra funds from its Private Conflict Counsel program. The San Diego County Bar Association is based Downtown at 401 West A St. For more information, visit sdcbf.org. St. Paul’s Senior Services was awarded the Eli Pick Facility National Leadership Award from the American College of Health Care Administrators (ACHCA). The award is based on data-driven criteria used to identify high-performing nursing facilities. Last year, only 284 of the nation’s 15,600 facilities received this honor. The Facility Leadership Award was introduced by one of ACHCA’s most revered leaders, the late Eli Pick, in 2008. Pick worked with colleague John Sheridan of eHealth Data Solutions, to develop an awards program that uses data-driven criteria to objectively identify high-performing skilled nursing facilities and the leaders who make them excel. Today, Eli Pick Facility Leadership Award recipients are identified using publicly collected data by the Centers for Medicare & Medicaid Services (CMS), which is pulled and evaluated by an independent third party. St. Paul’s Senior Homes & Services is a full service retirement provider, offering independent, assisted living, and skilled nursing communities, child and senior day care programs and a program of all-inclusive care for the elderly. St. Paul’s has three facilities, all located Downtown just east of Balboa Park. For more information, visit stpaulseniors.org. In the spirit of continuing to identify community programs and services that help spur economic and community activities within low- to moderate-income communities, the Civic San Diego (CivicSD) board authorized its staff to establish a Fiscal Sponsorship Program. Serving as a “Fiscal Sponsor” will allow CivicSD to leverage its 501(c)(3) status to accept grants and steward funds on behalf of organizations that support community reinvestment activities. These activities will improve the living conditions of disadvantaged or emerging neighborhoods that do not have nonprofit status. This new philanthropic service offered by CivicSD would respond to the needs of a variety of community-driven organizations that lack the tax status required to receive grants from private foundations, government agencies and philanthropists, and position CivicSD to help the philanthropic community’s ability to support activities involving workforce development, small business success, affordable housing and environmental sustainability. For more information, visit civicsd.com. USO San Diego has dedicated a prestigious STAR award to “Papa Doug” and Geniya Manchester in recognition of their patriotism and philanthropy in support of the U.S. Military and USO San Diego. The STAR plaque will hold a permanent place on the patio wall of USO Neil Ash Airport Center at San Diego International Airport. The center is a modern airport lounge catering to traveling military service members and their families. Doug Manchester is a long-time champion of the U.S. military. In 2004, he went to Iraq to demonstrate his support for the military by connecting troops with their families during the holidays so that they could speak to one another. Last year, he served as the Presenting Title Sponsor for USO San Diego’s 75th Anniversary Stars and Stripes Gala. A record 35 million people visited San Diego last year, according to the San Diego Tourism Authority (SDTA), the private nonprofit responsible for attracting visitors to the region. In addition to the record number of visitors, the amount of spending by visitors also hit an all-time high in 2016, reaching $10.4 billion. Major events such as the Major League Baseball All-Star Game, the AMGEN Tour of California and Comic-Con International helped fuel growth in 2016. In fiscal year 2016, a record $267 million in hotel tax revenue was collected by local governments, which will help fund city services such as police and fire-fighting programs, and street repairs. To continue building on 2016’s growth, the SDTA launched a $12.4 million advertising campaign in January, which includes television, print and digital advertising. The campaign features the Happiness is Calling “Signs” video ad, with new spots including updated footage and a new song. The television ads will air in six markets including San Francisco, Sacramento, Seattle, Dallas, Chicago and New York City. San Diego’s brand will also be seen on the pages of Condé Nast Traveler, Bon Appétit, and other magazines, as well as on travel websites such as TripAdvisor, Expedia and Priceline. In partnership with Brand USA, the SDTA is also running digital advertising in Canada and the United Kingdom. The Housing San Diego’s Future Alliance announced a series of community events in 2017 that will address the housing crisis and related issues facing the San Diego region. Titled Housing San Diego’s Future, the series will initiate a conversation region-wide to develop solutions for increasing the housing stock at all income levels. The program aims to come up with viable solutions and maintain San Diego residents’ quality of life in the future. The first event of this program is CityAge: Build the Future, set for April 25 and 26 at the San Diego Central Library, 330 Park Blvd. This event creates a platform for local and international leaders to discuss the building of the urban economy and society, with a particular focus at the San Diego conference on the “business of housing.” Those wishing to attend may register online at bit.ly/2nN2mXh. The Housing San Diego’s Future Alliance is a group of leading organizations coming together to address the housing crisis and related issues in San Diego. Additional conferences scheduled this year may be viewed at housingsandiegosfuture.org.